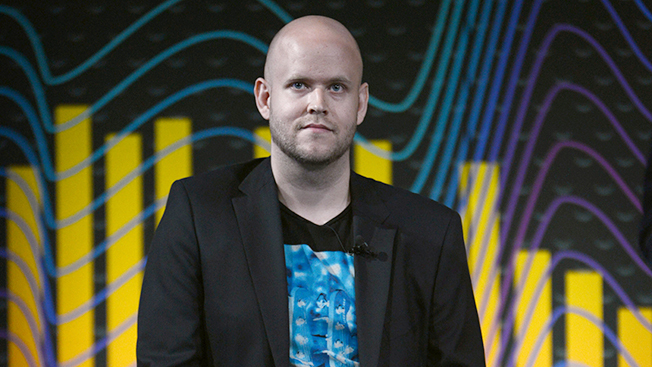 Irked by pop star Taylor Swift's much-hyped departure from Spotify, the music platform's CEO Daniel Ek took to a blog today to claim that his tech player has doled out some $2 billion to artists since 2008. Also, Ek wrote that his Stockholm, Sweden-based company has paid musicians $1 billion in the last year. As his privately held firm has previously stated that it pays artists around 70 percent of its revenues, with the application of a little back-of-the-napkin math that means Spotify's sales were nearly $1.43 billion in the last year. According to the International Federation of the Phonographic Industry, the global music marketplace generated $15 billion in business last year, down from $16.5 billion in 2013. So unless the last 12 months have shown unusual growth in the music business, Ek's remarks suggest that Spotify has been responsible for roughly $1 for every $15 (or 6.6 percent) in the last year. And the IFPI has said that streaming music services were 39 percent of the industry last year, or $5.9 billion. Therefore, if Ek's statements are accurate, his company has a 17 percent share of the digital streaming marketplace. The other dozen or so music streamers might have something to say about that. At any rate, Taylor Swift's sales don't appear to be suffering after quitting Spotify. Far from it. Even though Ek writes that Swift was on pace to pull in $6 million this year before she yanked her catalog from his platform, her new album 1989 sold 1.2 million copies in its first week, per Nielsen SoundScan, which equates to roughly $12 million in seven days.